It’s a rainy night tonight. I spent the majority of the day outside, caught in the downpour and now my bones are feeling it. I don’t know what else to do but try and find a movie to watch and review the long list I have already watched. It feels almost fitting. Everything else though, can just be ignored. 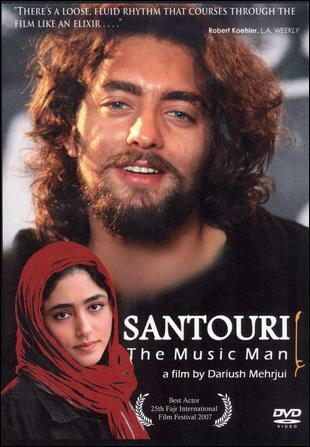 Directed by Dariush Mehrjui, “Santoori” depicts a fairly common story of musician-caught-in-the-hip/busy-lifestyle-but-then-everything-catches-up-with-him-and-it-just-all-crumbles-to-the-ground, but different! It has this middle eastern flare to it. It’s great. The movie starts out with the main character, Ali Bolourchi. He’s a famous Santoori player, coming from a wealthy family. He’s that handsome guy and all the ladies and men love him. His family is religious, and they made him choose between his music or his family- and you can guess what side he chose. SO! Here’s the main points of how this mans life crumbled to pieces. 1- It starts out about him telling that when he started to play shows right after his wife left him, that he would always go to formally thank her, and see her bright and shining face in the audience, but thus, she wasn’t there anymore. It was just an empty seat. 2- His drug lifestyle was built up fairly common, he would go and play at house parties and his awesome friends would hook him up. One of the house parties that was focused on, was the one where his wife met the man who she would eventually end up with. There was this scene where you saw Ali sneak to the side room, and of course- Hanieh (Ali’s wife) was walking confused, turning sad and then just giving up and starting to talk to other people at the party. One of the people she ended up talking to, was Javid. He invited her to come play piano for charity shows. She agrees and that’s that. *It should be noted that “Playing the Santour” in Farsi, is another way of saying injecting heroin. Now you know. 3-Now Ali’s drug habits are just becoming ridiculous. He’s starting to lose gigs and performances. He’s wasting any money he has on the stuff and Hanieh is starting to support the idiot. It goes on for months like this and I guess Hanieh finally breaks the night where she explodes with what she’s been dealing with, the two of them get into a fight and Ali hits her. That’s the night she leaves him for her mothers, and she stays gone. 4- Now Ali is alone and his habit, alongside his lack of an income is just making life impossible. His incredibly in debt, he’s being kicked out of his apartment and his family is only just beginning to know where he is physically and mentally. His father eventually stops by, surprised by the lack of furnishing in the apartment and surprise to see his son injecting heroine right then and there. He begs him to come with him, he would find a hospital or a rehab center, but Ali refuses. He takes whatever cash his dad has on him at the moment and pushes him out. 5- Everything is spiralling, he gets kicked out of his house and starts living on the street. He begs and figures out anyway to get more drugs. Hanieh, now with Javid- are moving to Canada (ha) and wanted to say goodbye before leaving. They’ve heard through the grape wine that he was living in this general area, and went to go look for him. But they’ve only got to see a glimpse before he an off in the distance. Not having time to look, they call his dad to deal with everything and thats went things start to happen. From there, his dad brings a big group of men and takes him the the rehab center. For months that’s where he stayed, and he eventually decides to stay there indefinitely- teaching the Santour to the other people going through what he did. That’s basically the end of the film. What I liked about this film was the fact that it was a familiar story that I’ve heard before, but it had this middle eastern flare to it. There were different characters and backdrops, and important scenes that build the story up- but like i said- it was a story I had heard before and I have a really hard time connecting to it in a emotional way. It was just one thing after another, to a very (what I felt) corny ending. What I also liked, was the great character of Hanieh- for some reason I always connect the females to be slightly submissive in middle eastern culture (but that’s probably just western media breathing down my neck), but she wasn’t! She dealt with everything and the moment he hit her- she was like “Screw this, I’m out”. It was great. 3 and a half Santours. I recommend this movie for a rainy night where you’re still fully kicking and feel like following the subtitles of the film. Unless you’re Iranian, then good for you. Below is the complete film on youtube! Enjoy!